Contributing dwellings on Flad Avenue. 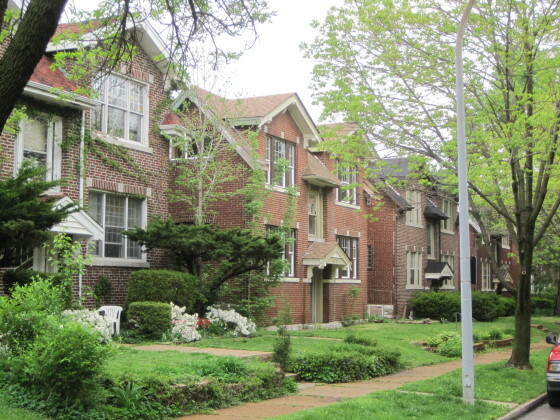 The Shaw’s Garden Historic District is located approximately five miles southwest from the Mississippi River at downtown St. Louis. The site is largely flat, with a slight slope downward toward the southwest. Throughout the District, there are mature street trees, defined tree lawns and landscaped front yards. The buildings are coherent with shared setbacks, masonry construction and middle-class typologies. These features make the District abundant with planted flowers, trees and shrubs that connect it visually to the nearby historic landscapes, Missouri Botanical Garden and to Tower Grove Park. These landscapes are planted and architect-designed historic landscapes, and provide a park-like setting for much of the District. The north end of the District, however, meets the raised lanes of Interstate 44. By 1955, the heaviest period of development ended, and most buildings had been completed before 1940. The district contains almost exclusively residential properties of similar age, form and materials, most of which are multi-family buildings. These multi-family buildings include two- and four- family buildings with external entrances as well as walk-up apartment buildings. Almost all of the buildings in the district are of masonry construction, with red brick being the dominant face material. The district’s buildings are in several styles, with Late 19th and 20th Century American Movements, Craftsman/Bungalow and Tudor Revival being most prevalent. 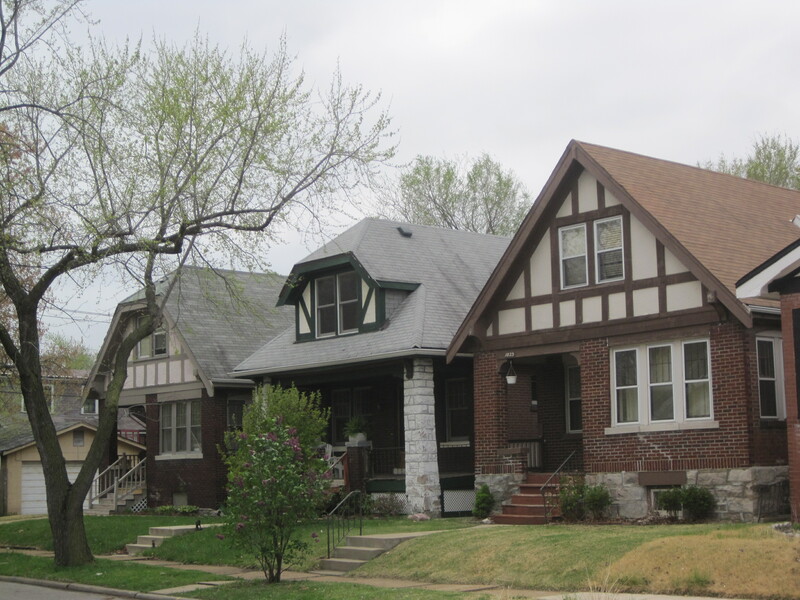 There are two private courts of single- family residences, Gurney and Heger courts, as well as groups of single-family homes on Alfred, Magnolia, Shenandoah and Tower Grove avenues. A Craftsman style dwelling on Gurney Court. The District represents the fulfillment of the desire of the Missouri Botanical Garden under Director George T. Moore to improve its surroundings through subdivision of property bequeathed to the Garden in the will of Henry Shaw, and the clear vision of suburban development advanced by the Garden’s long-time landscape architect John Noyes. The resulting landscape is a rare realization within the city limits of progressive suburban planning ideals implemented in contemporary landscapes in St. Louis County. The Shaw’s Garden Subdivision dominates the district’s landscape and sets its neatly-regulated physical and architectural character. Thus, the District encompasses 18 city blocks built out largely between 1916 and 1955 as a cohesive residential streetcar- served neighborhood embodying progressive concepts in suburban planning influenced by local subdivision plans by landscape architect Henry Wright as well as national ideals. Development of the three subdivisions in this District are associated with residential development spurred by the city’s streetcar grid, the influences of Wright and the Garden City movement in local subdivision planning, the use of deed restrictions to limit uses and building sizes and the rise of the private street. The land that would become the district as seen in 1898. Source: Archive of the Missouri Botanical Garden. The land that would become the District was first divided by French settlers in 1769. Settlers farmed these arpents into the 19th century, when advancing urbanization led to sales of combined parcels to landowners who formed larger parcels. One of these owners who would greatly shape the future of the area included in the District was merchant Henry Shaw (1800-1889). On an 1851 journey to England, Shaw visited the impressive gardens of Chatsworth and returned to St. Louis prepared to dedicate part of his land holdings to establishing a garden worthy of the city’s future greatness. 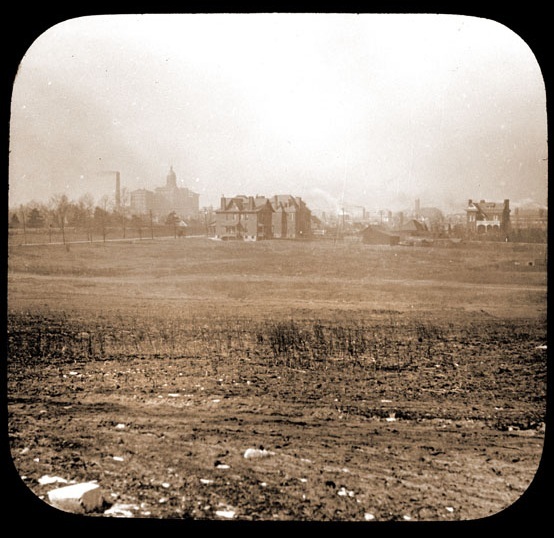 Shaw’s resulting development would create in the next 100 years a cohesive landscape that would include a major public park, a private botanical garden and several subdivisions in which elegant residential buildings, churches and commercial buildings would rise. The historic character of the District originated under the leadership of Missouri Botanical Garden director George T. Moore and his trusted landscape architect John Noyes. Moore also had a keen eye for the quality of the Garden landscape. By 1915, Moore made Noyes the official landscape architect of the Missouri Botanical Garden, a position that he would hold until it passed to Emmet Layton in 1955. In 1916, the Missouri Botanical Garden subdivided and started selling lots in a new development to its north, named Shaw’s Vandeventer Avenue Addition. This followed the Garden’s decision in 1914 to subdivide a tract north of Lafayette Avenue named Shaw’s Lafayette Avenue Addition. Moore had no use for these holdings, which were valuable sources of income for his programs. However, rather than simply sell large pieces of land to investors who would subdivide them, Moore decided to have the Garden plat the additions using Noyes’ hand. Shaw’s Lafayette Avenue Addition was quickly successful. Two-thirds of the lots had already sold. 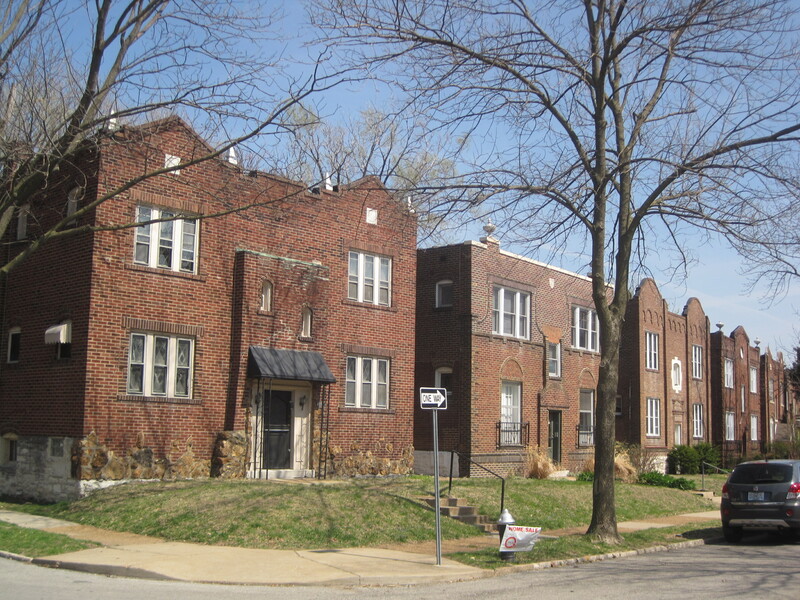 Dwellings on Alfred Avenue in the earlier Shaw’s Vandeventer Addition subdivision. Moore and Noyes’ interest in subdivision stemmed not only from a desire to maximize profit, but from a desire to have the Missouri Botanical Garden surrounded by subdivisions of high quality that would enhance the Garden setting. The trustees had never considered such plans before Moore, but embraced his vision. With excellent streetcar access on Vandeventer, Shaw’s Vandeventer Avenue Addition was also very successful. The Garden’s role was limited to design of the plat. 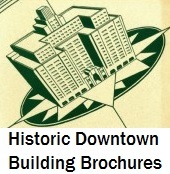 City government laid sidewalks and streets and constructed utility lines, while private developers built all of the buildings. In the 1910s, Moore was increasingly alarmed with the impact of smoke in the city on the Garden’s specimens, and was active in citywide efforts to pass a new anti-smoke ordinance. Moore deliberated relocating the Garden, but due to his desire that the Garden always be accessible by streetcar and foot, recommended to the trustees that the Garden remain at its site, but that plant-growing and arboretum functions be moved to a new site outside of the city. 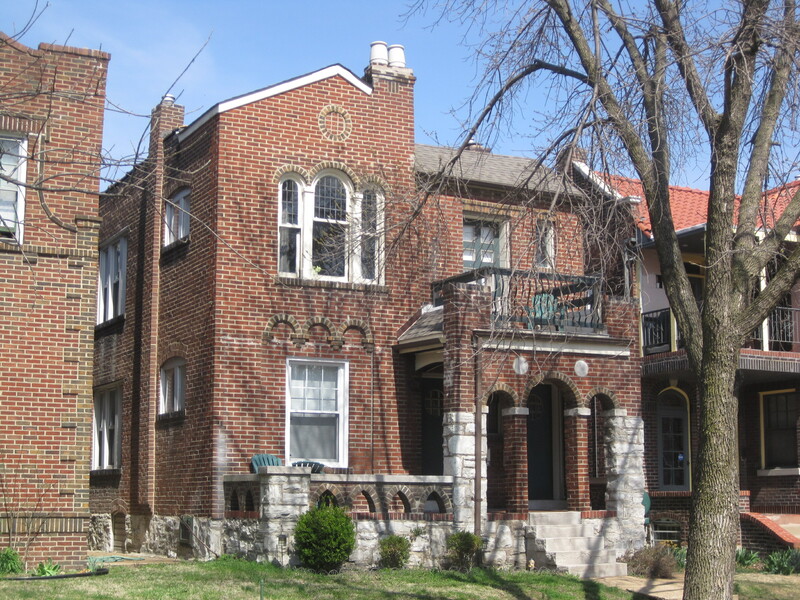 In 1922, Moore hired Noyes through his private firm to develop the 13-block Shaw’s Garden Subdivision west of the Garden. Noyes, used the irregular shape to express an elegant street plan that avoided adherence to the city grid. Noyes followed Frank Lloyd Wright’s principles in embracing the site slope and the constraints of the strange shape of the land. 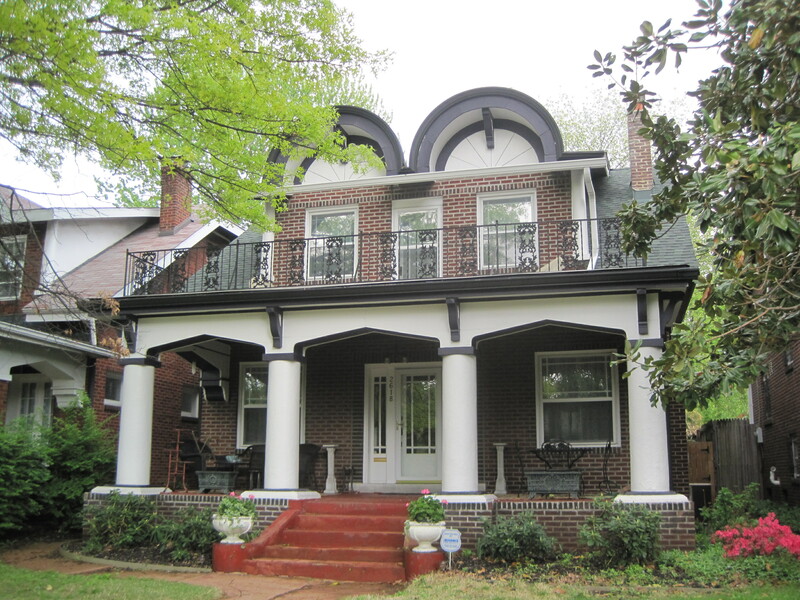 The district’s “garden” qualities are evident in this dwelling on Flad Avenue: brick and stone designed to look handmade, landscaped front yard, front porch. The curved contours of the streets and the resulting mix of long and very short blocks were not the only distinctive parts of the plan. In keeping with his admiration for street parks, Noyes set aside three parks within the subdivision. At the west end of Shenandoah was a circular park, and at the northwest corner they flowed into a diagonal entrance with circular park. These parks defined entrances into the subdivision from the major thoroughfare. Noyes also created an oval-shaped median park that was intended as a private place of single-family homes. These features gave the subdivision a park- like aspect appropriate for its site tucked between Henry Shaw’s great garden and park. Noyes’ achievement was clear: he had succeeded in creating a residential landscape that matched the park-like setting of its surroundings with an inventive approach to layout of a difficult property. Noyes created a subdivision plan highly unique for a residential plat intended for middle-class streetcar commuters and not wealthy people. Multiple dwellings on Shenandoah Avenue. By the end of development in 1955, the group of subdivisions from Magnolia Avenue north to DeTonty Avenue had become a cohesive and well-planned suburban residential enclave bordering the esteemed Missouri Botanical Garden. Coincidentally, the end of construction came near the retirement dates for George T. Moore and John Noyes from active work at the Garden. The era had ended with Moore’s vision completed and Noyes’ planning ideals fully realized.